So, when you go out to pick up the best FreeSync monitor for G-Sync, there are just a couple of things you need to take into consideration. First, is obviously going to be a high refresh rate. Because G-Sync will automatically change the monitor’s refresh rate to match your framerate in-game, shoot for the highest refresh rate you can get. 144Hz should be perfect for most people. Then, of course, you’re going to want to find a monitor with fast response time. If you’re big into esports, finding the fastest monitor is literally game-changing, so 1ms should be the goal. However, if you’re more into laid-back adventures, like Astroneer, this is not as big of a deal. This is a lot to take in, but we here at TechRadar have your back. We’ve picked out the five best FreeSync monitors for G-Sync, so you can spend less time shopping and more time gaming. TN panels make for great gaming monitors, even if they aren’t the most beautiful things in the world. They’re fast, affordable, and they’re color accurate enough for games, without going to the extremes needed for professional work. That’s why when we heard that the Asus MG278Q was one of the FreeSync monitors approved for G-Sync, we were appropriately excited. This monitor checks all the right boxes for an esports monitor, without driving the price through the roof. G-Sync? Check. HDR? Also check. The AOC Agon AG322QC4 isn’t the fastest gaming monitor out there (look at the entry above this one for speed), but it might be one of the prettiest. One of the prettiest that doesn’t cost a fortune at least. Not only is this a FreeSync monitor that now supports G-Sync, but it also supports HDR 400, so games that support it will look especially vibrant, on top of being tear-free. We wouldn’t recommend it to esports players, but everyone else should keep their eyes on this one. Let’s say you’re practicing to become the next big CS:GO or Overwatch world champ, but you just don’t feel like your monitor can keep up. You could go for some 144Hz panel, but why not go all the way? Why not go for a 240Hz 1080p panel, especially one packed with RGB lighting and a slick 1ms response time? We’ll that’s what you’re getting with the Asus ROG Strix XG258Q, and while that price tag seems high, it’s worth it for buttery-smooth frame rates. 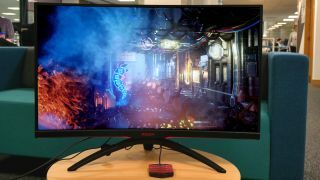 BenQ’s Zowie monitors are beloved for their esports cred these days, so when the BenQ Zowie XL2740 showed up on Nvidia’s list of FreeSync monitors for G-Sync, we were excited. This pro gaming monitor features a 240Hz refresh rate, 1ms response time and decent color accuracy for a TN panel. These specs, combined with an attachable screen shield make for a gaming monitor that esports players will want to take to every tournament.